For the first time ever this year, I saw a Snicker's Bunny. I'm not sure if they've been around in past years, but this was the first time I'd seen one. Of course, I had to investigate. I waited until the day after Easter to purchase my Snickers bunny, and I was rewarded. It was only a dollar. However, this means you'll have to store thick information away until you're able to buy one next year. I'm sorry to do this to you. But also...I'm not sorry because I got to eat a giant snickers. 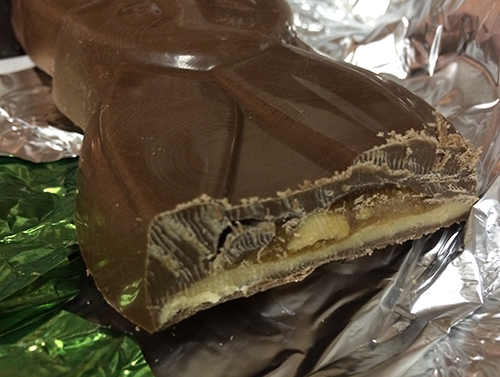 The Snickers Bunny, made especially for the Easter holiday, comes in a light green cardboard box. 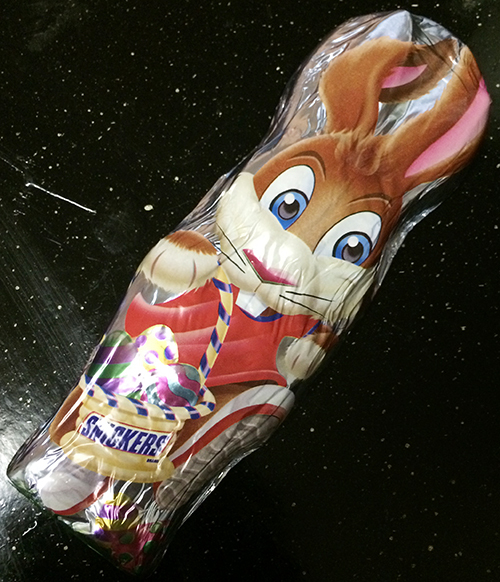 The box is hollowed on the front side, and the bunny itself is protected by a molded plastic piece similar to blister packaging. Once you open the box, however, you will be relieved to find out that it is not, in fact, blister packaging, and you don't have to ruin a pair of scissors to get at your treat. The foil surrounding the chocolate pictures a bunny carrying his easter basket, which is full of - presumably - Snickers eggs. The basket is yellow, making you think you might be getting a peanut butter snickers, but you aren't. 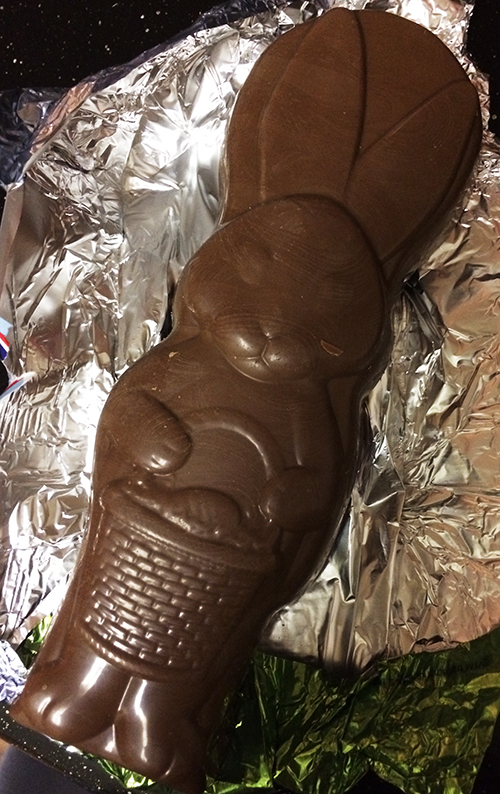 It's a giant, bunny-shaped, classic snickers. Now, once you're in, you'll see that the actual chocolate itself also looks like a bunny. I always find it a little strange when the foil and the actual chocolate don't really match, but I guess the chocolatiers just assume you're going to eat it anyway, so it doesn't matter. I also assume that they make one mold to use for years and years, and then they are able to update the foil wrapping and cardboard packaging every year to give it an update. However, I have never worked in the chocolate industry, so of course this is all conjecture. When you see the regular giant Snickers (AKA the Snickers Giant Size Slice N' Share), there is often an accompanying picture showing someone cutting the snickers into thin slices. So, I decided that was the way to go with this bunny. While it was probably only about as long as a King Sized Snicker and perhaps twice as wide, the size of it seemed to warrant a serrated knife. As you'll see above, however, this wasn't the best idea. The presentation left something to be desired. In the end, I ended up taking strategic bites - from one corner and then the other - and this worked out well enough. I think if I had wanted to use a knife, I could have heated one, and the cutting might have gone a little smoother. However, since I'm a spinster and I wasn't sharing, the biting worked just fine. I'm (sort of) proud to say I haven't actually finished the Snickers bunny yet. I can tell you, though, that like all seasonal Snickers, this one does taste better than an everyday Snickers. So, if you happen upon one within the next week, I say place it in your cart and prepare yourself for a treat. It's still springtime, so you can just say it's a spring bunny instead of one that's specific to Easter.